Travel deep into the enchanted forests of the Emerald Isle and join the sleepy, little leprechaun on a journey into online slots folklore. 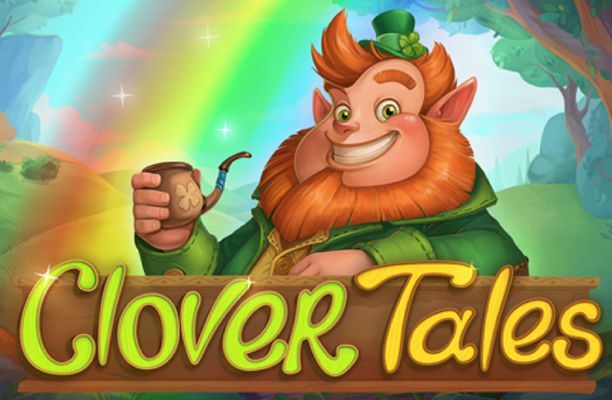 Clover Tales is a wonderfully quaint 5 reel that allows you to spin through reels of clovers, horseshoes, and tobacco pipes to win your small pot of gold and a whole load of other Irish relics. Playson are a Swedish developer, based in Malta and they pride themselves on being mainly focused on games of skill and social games with superb graphics. Their company may be small, only having about 250 employees, however their games are distributed amongst very well-known gaming platforms such as Quickfire, NYX, and Leander. Now see their latest creation, Clover Tales and see what luck it can bring for you! For more information about Playson's other range of slots games then click here. 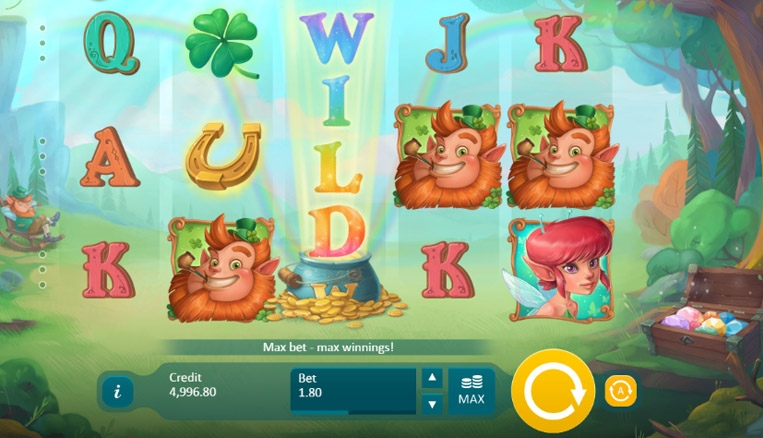 Try your luck with the Irish in this enchanting, mythical themed slot-game that has the potential to whiz you up a fortune – perhaps the horse shoe will be your lucky charm? Or will the magical elf glitter up your day by transforming your bank balance? There’s only one way to find out and who knows, by the end of just a few spins, there might be a pot of gold waiting for you at the end of the rainbow! With a set-up of 5 reels with 9 fixed paylines, this may appear like your traditional slot-game but what is immediately different is the array of bonus features and symbols throughout this game which is bound to engage your interest beyond just a few spins. Not to mention, with spins starting from just 27p (a penny for each pay-line) you can afford to spend both your time and money on this quirky penny-slot casino game! With £90 set at the maximum bet too, there is also a divine opportunity for those who wish to stake a little higher! One of the bonus features is the presence of a pot of gold, which is the expanding wild, and this will appear randomly throughout the game to replace the standard symbols with other symbols to increase the chances of accumulating a winning combination! This symbol also serves another lucky purpose, as landing 5 will result in the jackpot prize of 2500 coins, regardless of how much you placed on your initial bet! Two other vital symbols to keep your eyes peeled for are the leprechaun and the elf as 5 of the same characters seen anywhere on the reels will give you up to 1500 coins. From here, the reward goes down to 500 coins when you discover 5 of the lucky horse shoe, the pipe or the 4 leaf clover. The lowest paying symbols include the typical J, Q, K and A and will reward you up to 300 coins, depending on how many you can match on the reel! Another bonus feature involves the rainbow line displayed at the bottom of the screen, and when symbols stop here, a variety of games are unlocked. 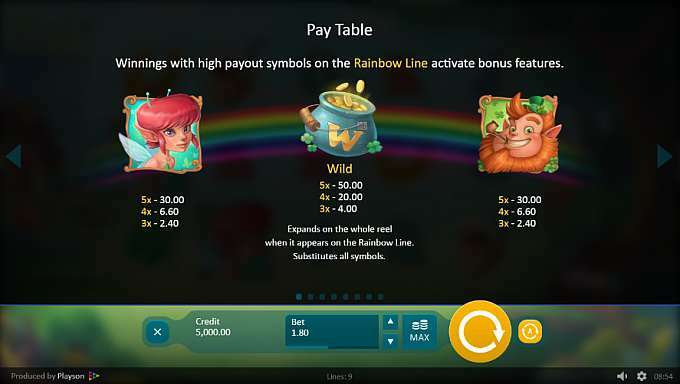 For example, if an elf of leprechaun lands on the rainbow line, 5 free spins will be given alongside 1 to 5 extra wilds, increasing your chances of landing 5 wilds overall to seize the 2500 coin jackpot mentioned earlier! If the pipe, clover, or lucky horse shoe lands on the rainbow line, you will be given the opportunity of a re-spin as well as sticky wilds! The luck of the Irish is a well-known phrase and Playson delivers this concept perfectly through this game. A fun animated game which brings all stereotypical aspects of Ireland together on one screen, and from 27p a spin, the odds certainly stand in your favour to do well in this game! If you enjoyed Clover Tales then might also like 24 online slots game.